Metropolitan Cityscapes. The City is us. As devotees of Architecture we often travelled to visit famous buildings, not satisfied to only view them in books. Each Architectural quest brought us to places we might never have thought to visit, walking streets we otherwise would not have walked. In the end, it was the journey and not the destination that mattered. In these places and on these streets, we bore witness to scenes outside our usual experience. The array of foreign sights, sounds and smells quickened our senses as we breathed in these new vignettes of urban life. Each journey's end left a growing desire, a need to create something we could hold onto to remind us of where we had been, a special keepsake to rekindle our memories and enable us to share stories with friends. And so the expeditions began. We started with Sydney, then our home, walking every street, recording every building. We then moved onto Berlin, explored Paris and then London. It became an addiction. Eckard cycled for two solid weeks to capture the dense, intricate hive of Tokyo. He hiked up and down the steep lanes of Hong Kong and travelled twice to Beijing to document a city that was rapidly changing for the Olympics, taking more than 3000 photographs. Cities are divided by a multitude of invisible boundaries; surprises are waiting around every corner. Walking every street means crossing these boundaries, a tedious process leading to exciting discoveries. We became accidental explorers, and inevitably perceived the city through different eyes. The centre of a city, its beating heart, is a palimpsest overflowing with imagery. Layers upon layers of stories have accumulated and disappeared through time. Behind each facade, each brick, each pathway, untold stories, memories and dreams are waiting to be narrated. Above all the noise, if you listen carefully, you can hear your own tale of the city. To tell our stories of the city, we peeled away all the complex urban layers so that only the bare bones of place remains. Each line drawn and cut on every cityscape has a distinct story. Metropolitan Cityscapes are a new vision of the city as organism. Each city is as different, and as beautiful, as we are. Metropolitan Cityscapes is an homage to the cities we have visited and those that have inspired us. In making them, we hope to create a starting point for your own stories and experiences. 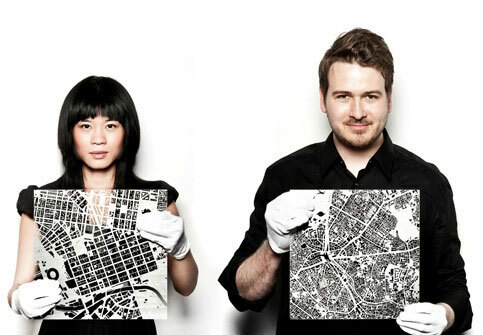 Current and former residents of Berlin, Sydney and Tokyo, Chauntelle Trinh and Eckard Buscher have a long held fascination for cities and the urban milieu. Working in the fields of Architecture and Design, they dealt with the minutiae of the city but yearned to explore the macrocosm of metropolitan life. They have been making art collaboratively since 2007.